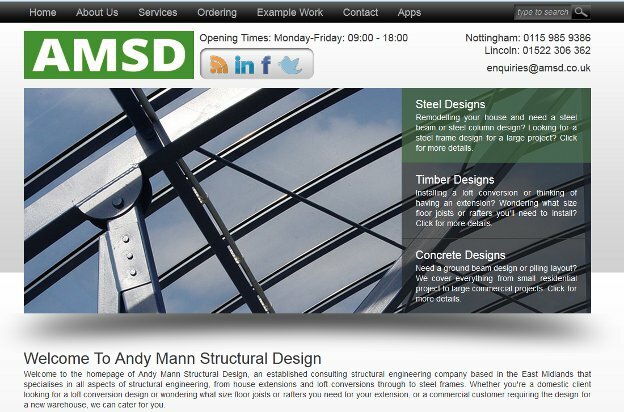 The new website for AMSD (Andy Mann Structural Design) has been launched this month. AMSD is a structural engineers in Nottingham that was looking for a new website to replace their existing one that was becoming outdated. Our design brief was to produce a site that felt modern and sleek, with an emphasis on style and images. The new website is designed using sleek black, grey and white colours, reminiscent of steel, with elements of green to tie in with teh AMSD colours. The new website is also functional, allowing customers to not only browse AMSD’s services, but also provide design specific details through forms that request information tailored to each structural design as well as allowing drawings and other specifications to be uploaded. As with all Mamu Computing websites, the new AMSD website has been developed to aid search engine optimisation, ensuring all pages have the appropriate titles, meta tags, alt tags, etc. The site has also been configured to provide an analysis of its traffic so its performance can be measured. The new website is also ready for expansion, designed with the ability to add extra services with minimal effort, allowing the website to continue to grow alongside the company. We wish AMSD all the best and hope they continue to grow and expand their services.